Verse 1: Clap your hands, all you nations; shout to God with the voice of joy (Ps 46:2). Verse 2: For the Lord most high is awesome, a great king over all the earth (Ps 46:3). Verse 3: He has subdued peoples to us, and nations under our feet (Ps 46:4). Verse 4: God ascended amid shouts of joy; the Lord, at the sound of the trumpet (Ps 46:6). Verse 1: Great is the Lord and greatly praised in the city of our God, His holy mount (Ps 47:2). Refrain: Son of God, who ascended in glory,* save us who sing to You: Alleluia. Verse 2: Mount Zion, the northern slopes, is the city of the great king (Ps 47:5). Verse 3: God is known in its strongholds, whenever He comes to its aid (Ps 47:4). Verse 4: For, behold, the kings of the earth have assembled, they have come together (Ps 47:5). We sing the usual Third Antiphon, but with the festal refrain: Son of God, who ascended in glory,* save us who sing to You: Alleluia. Troparion (Tone 6): Angelic powers were upon Your tomb* and the guards became like dead men;* Mary stood before Your tomb* seeking Your most pure body. * You captured Hades without being overcome by it. * You met the Virgin and granted life. * O Lord, risen from the dead,* glory be to You! 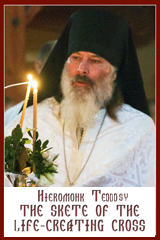 Troparion (Tone 4): You ascended in glory, O Christ our God,* giving joy to Your disciples by the promise of the Holy Spirit,* and assuring them through your blessing* that You are the Son of God,* the Redeemer of the world. 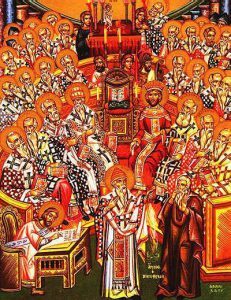 Troparion (Tone 8): Christ our God, You are glorified above all,* You established our fathers as beacons on earth* and through them guided all of us to the true faith. * Glory to You, most compassionate Lord. 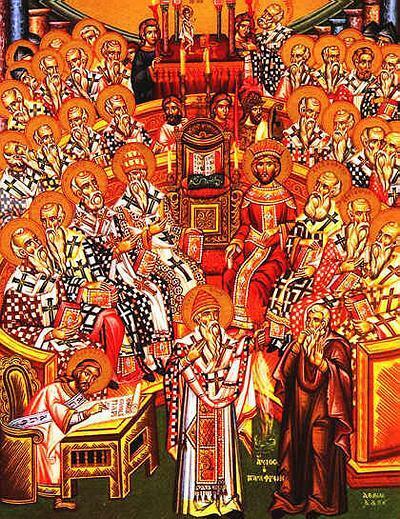 Kontakion (Tone 8): The apostles’ preaching and the Fathers’ doctrine* confirmed the Church’s one faith,* and wearing the garment of truth* woven from theology that descends on high,* she rightly imparts* the mystery of godliness* and sings its glory. Kontakion (Tone 6): When You had fulfilled Your plan for us* and united things on earth with those in heaven,* You ascended in glory, O Christ our God,* in no way distant, but remaining insep’rable,* You cried to those who love You:* I am with You and there is none against you. 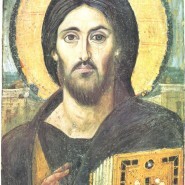 Prokimenon (Tone 4): Blessed are You, Lord God of our fathers,* and praised and glorified is Your Name forever (Dn 3:26). Epistle: (Acts 20:16-18, 28-36): For Paul had decided to sail past Ephesus, so that he might not have to spend time in Asia; he was eager to be in Jerusalem, if possible, on the day of Pentecost. From Miletus he sent a message to Ephesus, asking the elders of the church to meet him. When they came to him, he said to them: ‘You yourselves know how I lived among you the entire time from the first day that I set foot in Asia, Keep watch over yourselves and over all the flock, of which the Holy Spirit has made you overseers, to shepherd the church of God that he obtained with the blood of his own Son. I know that after I have gone, savage wolves will come in among you, not sparing the flock. Some even from your own group will come distorting the truth in order to entice the disciples to follow them. Therefore be alert, remembering that for three years I did not cease night or day to warn everyone with tears. And now I commend you to God and to the message of his grace, a message that is able to build you up and to give you the inheritance among all who are sanctified. I coveted no one’s silver or gold or clothing. You know for yourselves that I worked with my own hands to support myself and my companions. In all this I have given you an example that by such work we must support the weak, remembering the words of the Lord Jesus, for he himself said, “It is more blessed to give than to receive.” ’ When he had finished speaking, he knelt down with them all and prayed. Gospel: (John 17:1-13): At that time, Jesus looked up to heaven and said, ‘Father, the hour has come; glorify your Son so that the Son may glorify you, since you have given him authority over all people, to give eternal life to all whom you have given him. And this is eternal life, that they may know you, the only true God, and Jesus Christ whom you have sent. I glorified you on earth by finishing the work that you gave me to do. So now, Father, glorify me in your own presence with the glory that I had in your presence before the world existed. ‘I have made your name known to those whom you gave me from the world. They were yours, and you gave them to me, and they have kept your word. Now they know that everything you have given me is from you; for the words that you gave to me I have given to them, and they have received them and know in truth that I came from you; and they have believed that you sent me. I am asking on their behalf; I am not asking on behalf of the world, but on behalf of those whom you gave me, because they are yours. All mine are yours, and yours are mine; and I have been glorified in them. And now I am no longer in the world, but they are in the world, and I am coming to you. Holy Father, protect them in your name that you have given me, so that they may be one, as we are one. While I was with them, I protected them in your name that you have given me. I guarded them, and not one of them was lost except the one destined to be lost, so that the scripture might be fulfilled. But now I am coming to you, and I speak these things in the world so that they may have my joy made complete in themselves. Instead of “It is truly…”: O my soul, magnify the Lord who in glory ascended bodily into the heavens. Irmos (Tone 5): O Mother of God, you transcended both mind and word, and in time, ineffably bore the Timeless One: it is you who, with one accord, we, the faithful, magnify. Be exalted, O God, above the heavens; above all the earth be Your glory (Ps 56:6).